A 1957 Ferrari 335 S Spider Scaglietti (estimate above $30 million) from the Pierre Bardinon Collection leads the 2016 Artcurial Paris classic car sale. As a Scuderia Ferrari, the car was raced at amongst other Le Mans and the Mille Miglia. It was driven by leading drivers of the period including Mike Hawthorn, Wolfgang von Trips and Stirling Moss. The 1957 Ferrari 335 S Spider Scaglietti has been in the lauded Bardinon Collection since 1970. 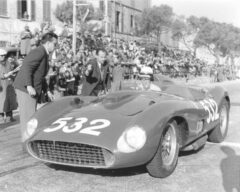 The 1957 Ferrari 335 S Spider Scaglietti on offer at the Artcurial Salon Rétromobile sale on 5 February 2016 is likely to become one of the most-expensive cars ever sold at public auction. If it reached its pre-sale estimate of $30 to $34 million (€28 – €32 million), it will only be second car ever to sell for more than $30 million at a public auction. The most-expensive car ever – a 1962/3 Ferrari 250 GTO – achieved $38 million at the Bonhams Quail Lodge 2014 auction while a 1954 Mercedes Benz W196R Formula 1 racer sold just short of $30 million at the Bonhams 2013 Festival of Speed sale. A 1956 Ferrari 290 MM by Scaglietti, driven to fourth place by Juan Manuel Fangio at the 1956 Mille Miglia, will be on offer at a similar estimate ($28 to $30 million) at the RM Sotheby’s Driven by Disruption auction in New York on 10 December 2015. The 1957 Ferrari 335 S Spider with bodywork by Scaglietti, chassis no 0674, was an official Scuderia Ferrari racing car. It left the factory in Maranello as a 315 S with a 3.8-liter V12 Tipo 140 engine producing around 360 bhp. As a works 315 S entry, the Ferrari was driven to sixth place by Peter Collins and Maurice Trintignant at the Sebring 12 Hours. 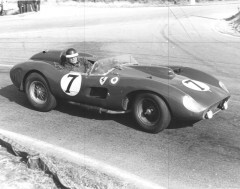 More famously, the Ferrari was driven by Wolfgang con Trips in the 1957 Mille Miglia to second place, behind Pierro Taruffi’s Ferarri. 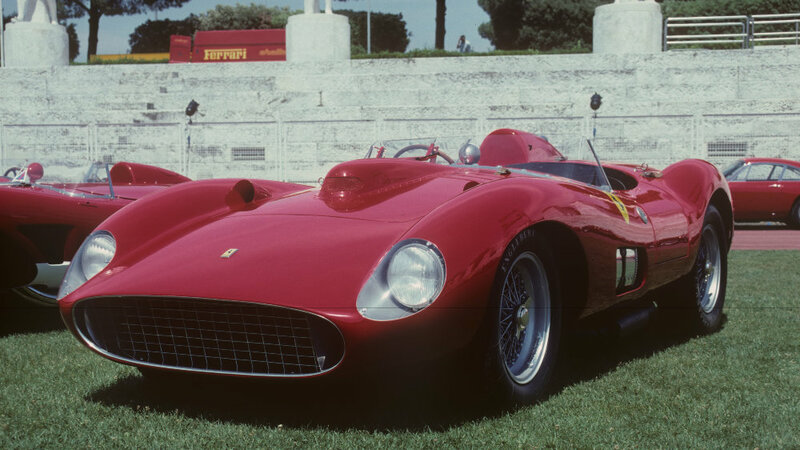 The 1957 Ferrari 335 S Spider Scaglietti has been in the Pierre Bardinon Collection in France since 1970. Bardinon famously collected only the best Ferrari racecars and his collection of around 50 Ferraris included four of the nine Le Mans 25 Hours winning Ferraris. The magnificent Baillon Collection that Artcurial offered at the 2015 Rétromobile auction was always going to be hard to beat but with the 1957 Ferrari 335 S Spider Scaglietti Artcurial certainly has another headline stealing car on offer. See 2016 Artcurial Paris Auction Early Entries for more on the 1963 Ferrari 250 GT SWB Berlinetta and the 1986 Ferrari Testrossa Spider built for Gianni Agnelli.